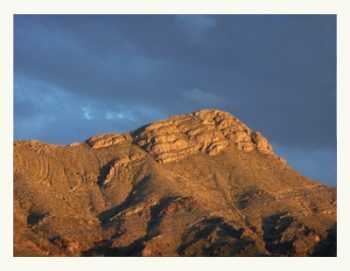 April 2019: Three-day Yoga Retreat, Fiesta Golf Tournament, Easter Egg Hunt at Elephant Butte Lake! 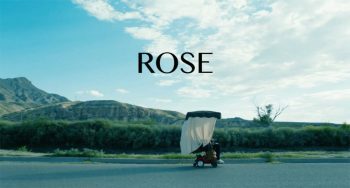 “Being Rose” was filmed in Truth or Consequences and the surrounding county. It stars Cybill Shepherd, Pam Grier, and James Brolin. Calling all cynophilists (that’s a fancy word for dog enthusiast) — don’t miss the AKC Dog Show happening in Truth or Consequences in mid-October! 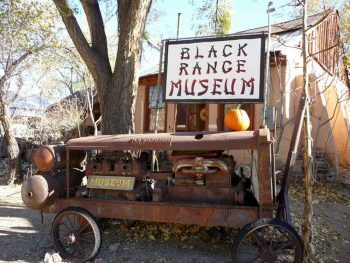 Consult our list of attractions and activities if you never want to run out of things to do in Truth or Consequences and Sierra County! 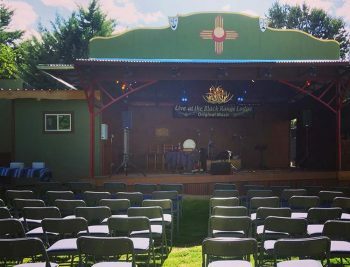 Pickamania — a weekend-long showcase of live music set in Kingston New Mexico, has evolved from its origins as a backyard party hosted in a garlic shed into a festival celebrating the love of acoustic music of all genres. 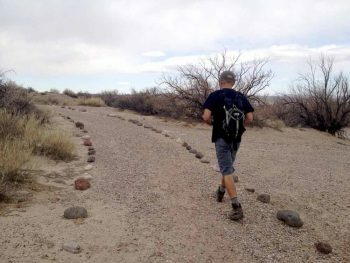 West Lakeshore Trail, 5 miles from Truth or Consequences, hugs the western shoreline of Elephant Butte Lake, spanning a 12-mile stretch of scenic desert landscape. 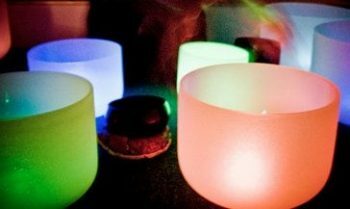 Dinner at Old Brick Cafe, party at Truth or Consequences Brewing, music by Milo Matthews, sponsored by MainStreet TorC! 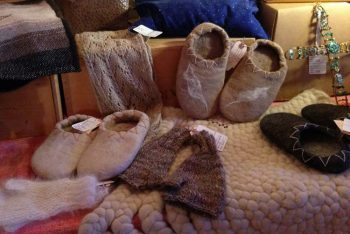 Save some holiday shopping for these special events sponsored by Sierra County’s artists, crafters, business owners and organizations. 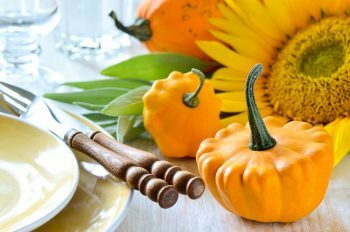 Thanksgiving dinner is available in downtown Truth or Consequences on Thursday November 23. 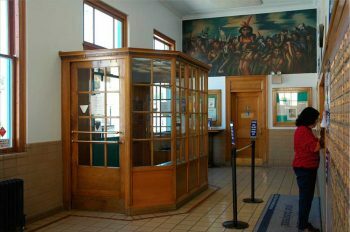 Saturday of Labor Day weekend, join Hillsboro and Kingston for arts & crafts, museum exhibits, walking tours, yard sales and more, as part of their “One Thousand Years: From Mimbres to Miners” event. 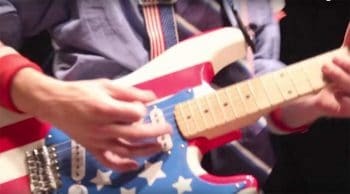 Celebrate Independence Day in Sierra County! 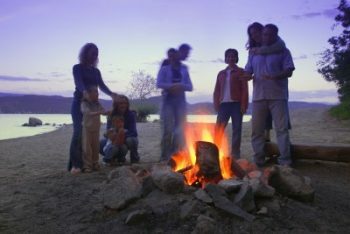 Two lakes with levels way UP, a cool river, a Beer & Wine Festival at the Dam Site, Fireworks, and more! 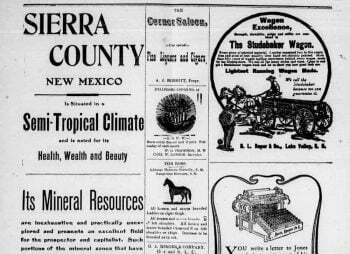 We enjoyed seeing a few pages from the Sierra County Advocate’s April 19, 1907 issue. That’s more than 110 years ago! Memorial Day Weekend is nearly here! 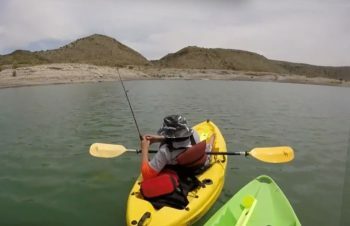 The weather is hotter’n blazes in southern New Mexico, but fortunately, there is a lot of cool refreshing water (2 lakes, the Rio Grande) just waiting for you to enjoy it! 2017 FIESTA begins with 2 events on Friday night followed by too-many-to-count on Saturday plus quite a few on Sunday! Who’s ready for funnel cake? 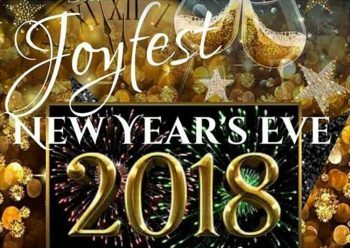 Round up the family and get in on the fun! 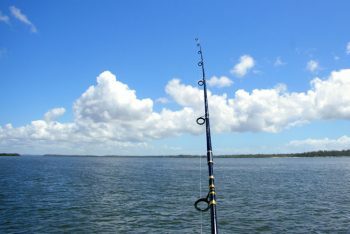 This catch-photo-release tournament is open to any non-motorized watercraft—canoe, kayak, rowboat, etc. Prize categories include largest & smallest largemouth bass, smallmouth bass, walleye. 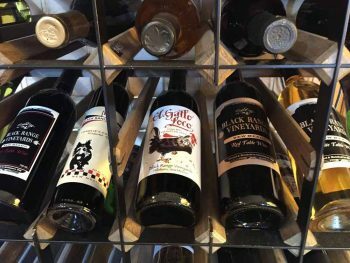 Three wineries in Sierra County – Shattuck Vineyards in Caballo, Black Range Vineyards in Hillsboro, & Point Blanc Winery in Truth or Consequences – sell local wine and offer wine tastings. 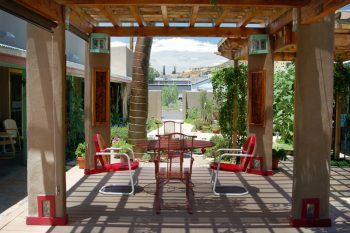 Pamper yourself at one of Sierra County’s Spa Facilities! 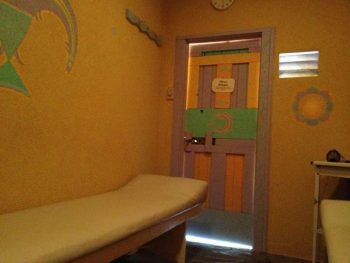 From Truth or Consequences to Kingston, you’ll find a variety of treatments: massage of all kinds including Ashi-Thai, plus craniosacral, wraps, mani-pedis, tarot, astrology, and (of course!) hot springs. When Elephant Butte Dam was completed in 1916, it was an engineering wonder, the largest facility of its kind in the world. 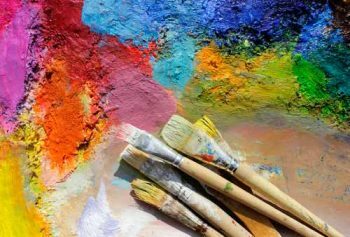 Sierra County has several options for artists looking for residencies and retreats. 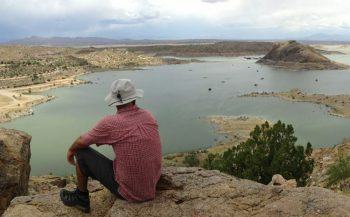 Ted Turner Enterprises’ ecotours in Sierra County take guests to areas of unspoiled beauty. This video offers a preview. 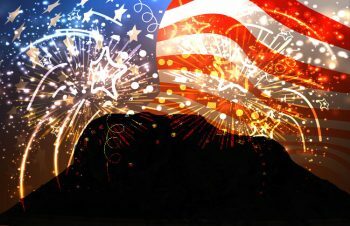 Saturday, July 2 – Fireworks Show at the Lake! 2016 Fireworks are set for July 2, with a rain date of July 3. 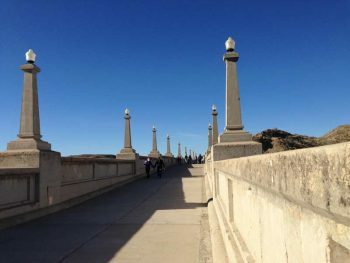 State Park fees are waived after 6pm. 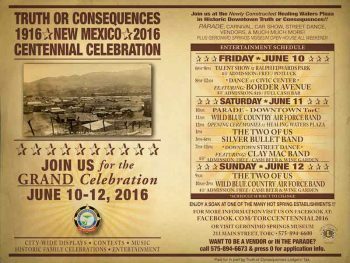 A lively schedule of events is planned for a Centennial Celebration to be held June 10-12. 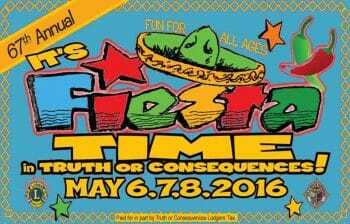 The 2016 Truth or Consequences Fiesta features familiar activities like the Parade, Junk Boat Race and Kids Fishing Derby, plus a brand new event: the Film Fiesta. Hungry at the Lake? 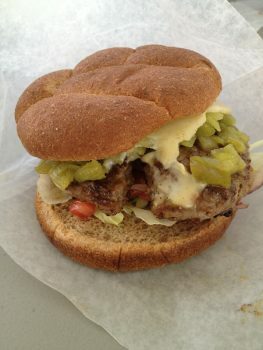 Burgers & Buns will be open for the season starting Easter Sunday. Damsite Restaurant opens May 1. 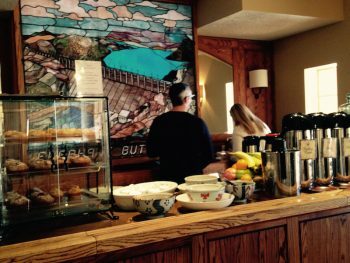 Sierra County has some charming restaurants that are off the beaten path. 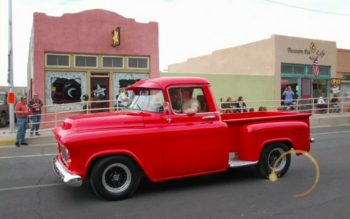 Enjoy a scenic drive to these dining spots in Hillsboro, Chloride and Arrey. 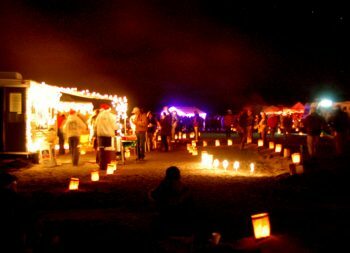 Old-Fashioned Christmas & Elephant Butte’s Luminaria Beachwalk are two festive events happening the 2nd weekend in December. 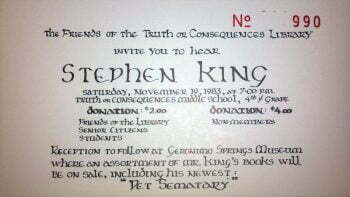 Stephen King in Truth or Consequences? Yes, that happened, on November 19, 1983. 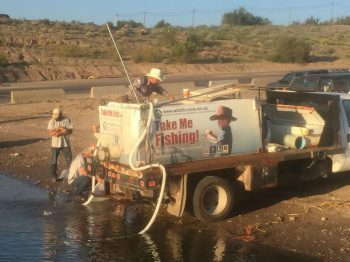 Elephant Butte Lake State Park, Fish & Game, and a team of volunteers introduced approximately 40,000 fish into the waters of the reservoir on August 13 2015. 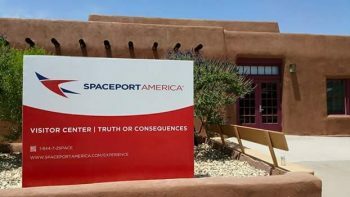 The Spaceport America tour lasts approximately 4 hours, and includes a look at the Gateway to Space, the Spaceport Operation Center, the runway, and history & information on the area. 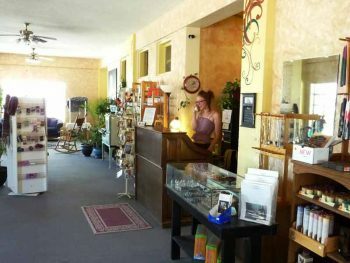 Downtown Truth or Consequences has two new Visitor Centers located in the heart of the hot springs district. 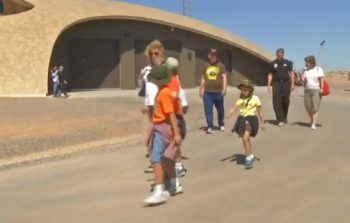 The Spaceport America Visitor Center and the Geronimo Trail VIsitor Center opened to the public on June 26. 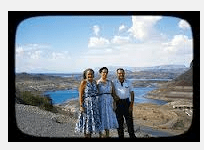 BIG 4th of July 2015 Weekend in Elephant Butte New Mexico! 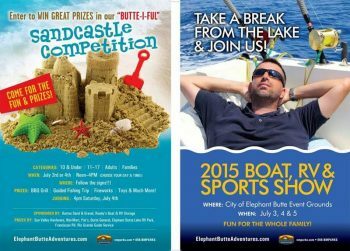 Fourth of July 2015 at Elephant Butte Lake will include a Sand Castle Building Contest, RV & Boat Show, and the big Fireworks Show. 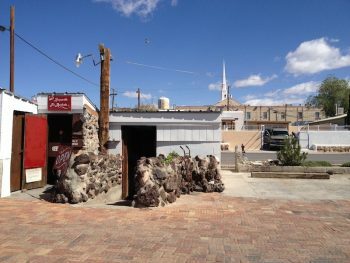 The City of Truth or Consequences, with enthusiastic support from the New Mexico Historic Preservation Office, is currently overseeing revisions to the Lee Belle Johnson Center, which is set to open in late June as an interim Spaceport America Visitor Center. 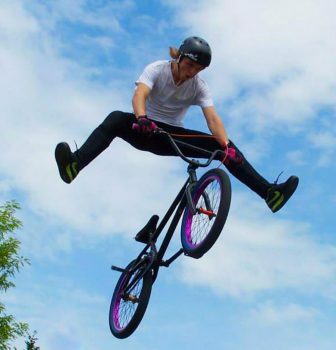 The City Pool uncovers in the hot springs district while a BMX bike track debuts on south Broadway. Volunteers Needed to Move Fish! 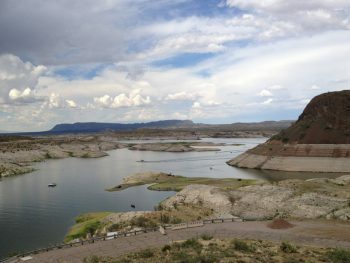 A fish-stocking effort in early May added about 20,000 young fish to the waters of Elephant Butte Lake. 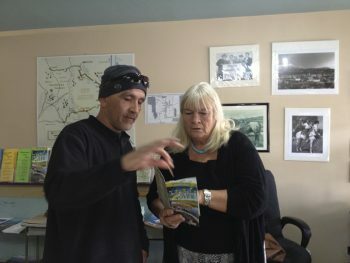 “Curious Townie” Steven Westman loves all of NM, and has a great appreciation for Truth or Consequences. Here, he promotes Fiesta on The Morning Brew. 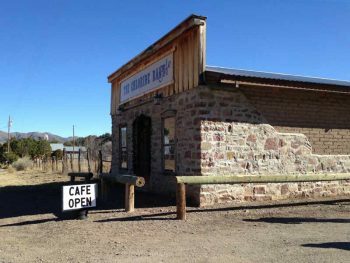 NOW OPEN: Stone Age Cafe, Los Fidencios, Dam Site, and General Store Cafe: restaurant news for Truth or Consequences, Elephant Butte, and Hillsboro. 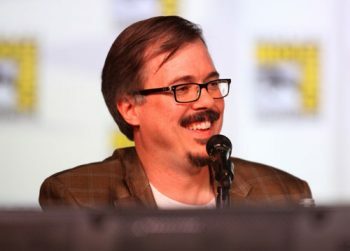 A new commercial for Truth or Consequences, its downtown, and ten wonderful hot spring spas. 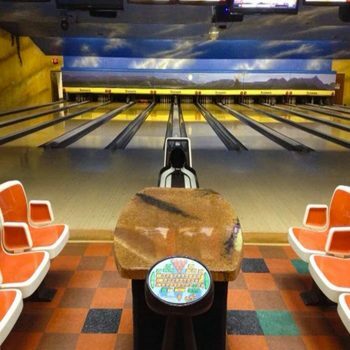 Bowling is Back in T or C! The Bedroxx Bowling Alley has reopened – leagues are forming in April, lessons and pro shop available now. 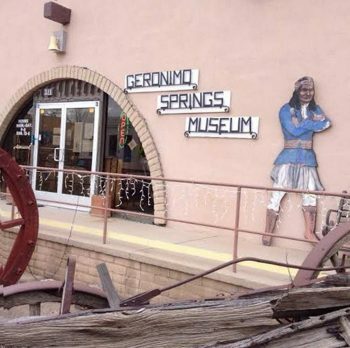 Two historical societies, some fabulous museums (Geronimo! 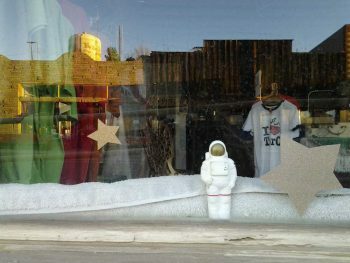 Pioneer Store!) 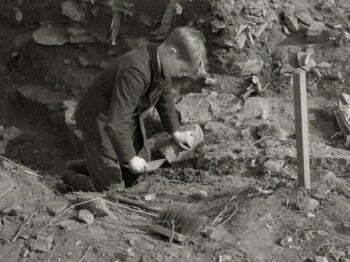 and the Kingston Spit and Whittle Club keep history alive in Sierra County. Sierra County rings in 2015 with Health: First Day Hikes, a Full Moon Run and 2 wellness workshops. 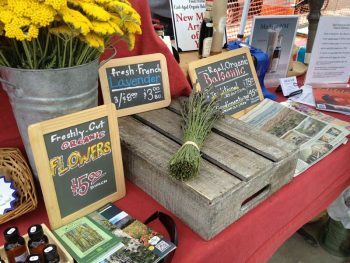 Hot news in the old hot springs district! 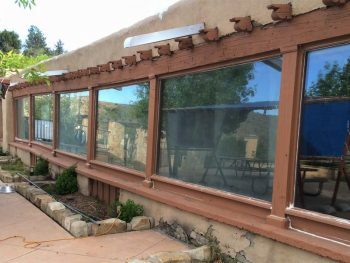 La Paloma Too, formerly Hay-Yo-Kay, opens for soaks on November 28. Marcia McCoy’s photos of Truth or Consequences plus 2 books related to the imagery will be featured at the November Art Hop in downtown T or C.
Four Shillings Short will celebrate the Celtic New Year – a precursor to modern-day Halloween – on October 26 in T or C.
On October 25 2014, an Architectural Tour of Truth or Consequences and Elephant Butte will be held for members of the New Mexico Architectural Foundation. 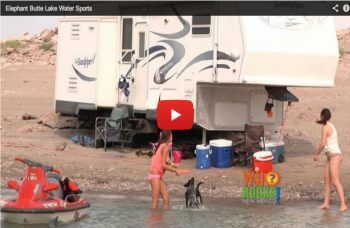 Elephant Butte Lake RV Resort has opened a beautiful new recreation facility that features an indoor swimming pool as well as banquet and meeting capability. 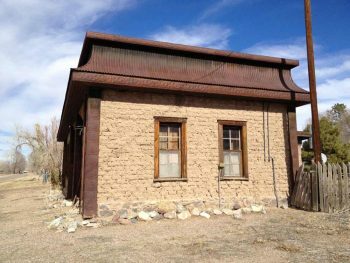 “Travel Through Time” at the 16th New Mexico Architectural Fair at Ralph Edwards Park in Truth or Consequences on October 4 from 10am-4pm. 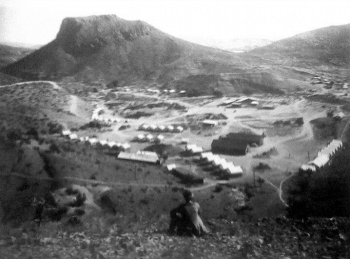 Truth or Consequences New Mexico and the nearby historic mining town of Chloride receive the New Mexico True Television treatment. 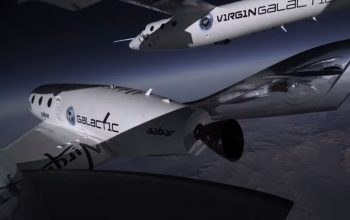 Virgin Galactic’s Third Powered Flight – Video! Video of Virgin Galactic’s & SpaceShipTwo’s Third Powered Flight, which happened on January 14, 2014. 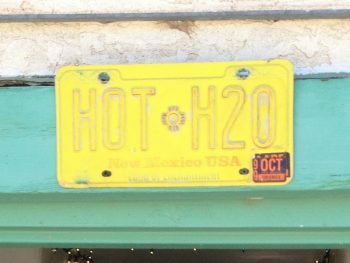 On Truth or Consequences’ hot springs, holistic healing, and how those two things have complemented one another for…ever. 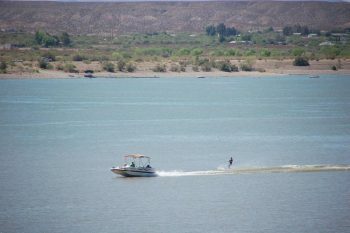 Stuck In the Sand at Elephant Butte Lake – What To Do? So many of us have been there. At the lake, where there’s all that lovely sandy beach. And you can drive on it! Or can you? Truth is, it is all too easy to get your vehicle stuck. 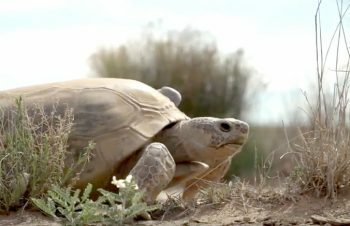 Steven Westman, Wes Naman and Joy Godfrey jumped in an RV and hit the 575 during the month of May to photograph any and all willing New Mexicans. 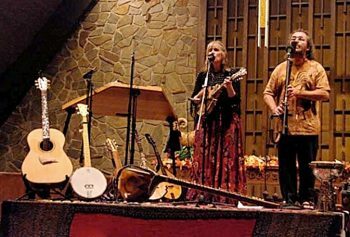 The Hillsboro Concert Series brings talent to the picturesque village’s Community Center. 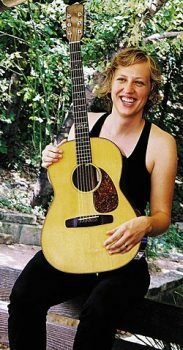 This Saturday, January 19 2014, listen to the haunting melodies of Ana Egge and hit the wine bar after! 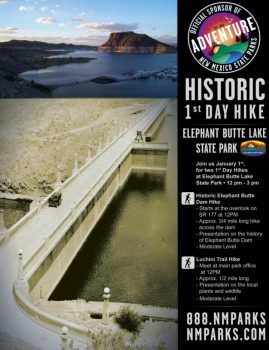 New Years Day hikes at Elephant Butte Lake – one at Luchini Nature Trail, the other on the historic Elephant Butte Dam which has been closed to traffic since September 11, 2001. 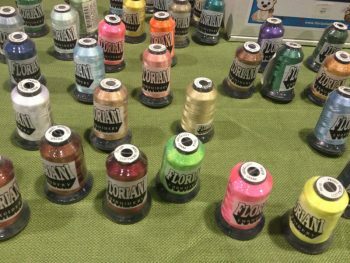 Having knocked out 21 consecutive soaks, Ruanna Waldrum assesses the results. Labor Day Weekend at the lake, old geezer style. 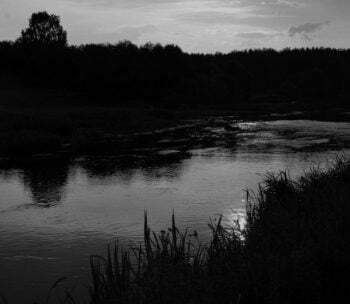 No racing motors (except from afar), just a quiet park, wildlife and great views – the perfect staycationette. 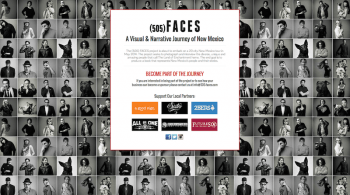 Labor Day Weekend 2013, join artists and residents of Hillsboro and Kingston New Mexico as they celebrate Common Ground in the wake of the Silver Fire. 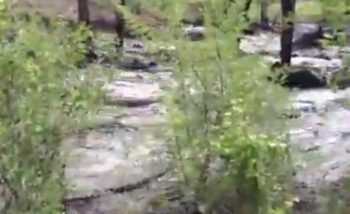 In the aftermath of the Silver Fire, there was concern that Hillsboro could flood. Turns out there was a flood but it didn’t get as far as Hillsboro. 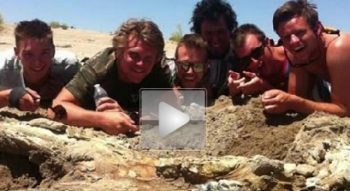 This video footage was submitted by Catherine Wanek of the Black Range Lodge. 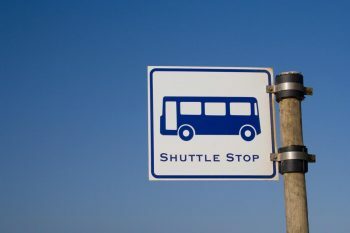 Spaceport America tours are gaining in popularity. 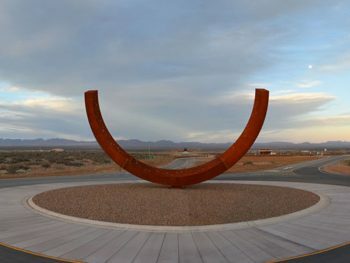 Take advantage of this opportunity to see the Spaceport up close and personal before the official Visitor Center opens! 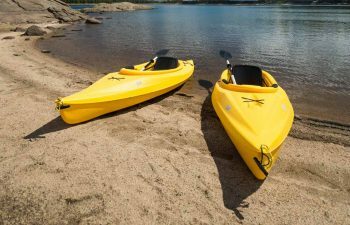 Cool off with a river float in Sierra County this summer! Then take in the fireworks. Boat, float, swim, splash, fish, sunbathe, build a sand castle, relax. Times are you can, other times are you can’t. Either way Caballo Lake provides a nice contrast to its bigger more popular counterpart up-river. If you’re in Winston, check out the old carriage house. We are pretty sure you’ve never seen anything quite like it. It’s true. There really is a restaurant floating around out on the lake during summer months. 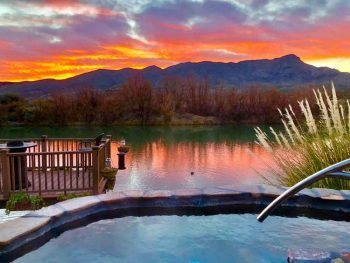 Winding up the “21 day soaking regimen” at Riverbend Hot Springs’ public pools – 5 temperatures to choose from with gorgeous river views, not bad! Learning the hard way that soaking should never be though of as an endurance contest. 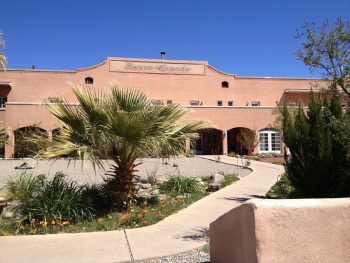 Pre-Fiesta escape to peace and quiet at La Paloma Hot Springs & Spa. 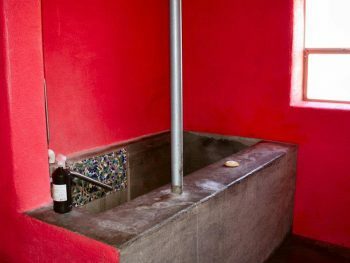 Sierra Grande Lodge’s Spirit Bath is big, beautiful, and is filled by a mineral waterfall. Also – jets! 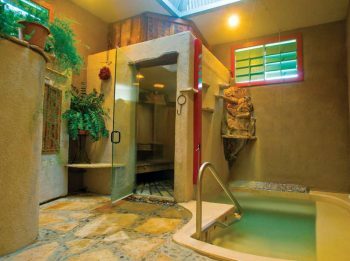 Visit to the indoor baths at Hay-Yo-Kay – and yes, you WILL sleep better after bathing in the hot springs of Truth or Consequences! 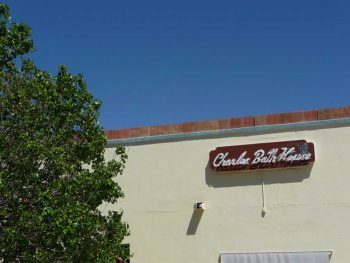 Schedule time before or after your bath at the Charles Motel & Spa to check out the gift shop. 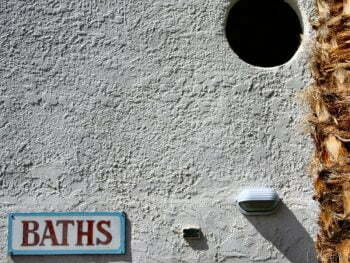 The bad news: Pelican Spa’s baths are for Lodging Guests only. 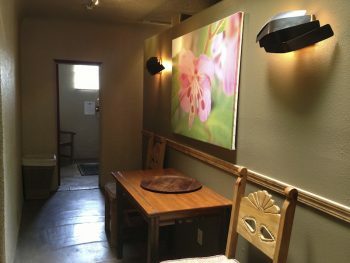 The good news – Pelican Spa has more than 25 lodging rooms! A trip to Blackstone’s extremely popular Wet Room – mineral bath + steam room! 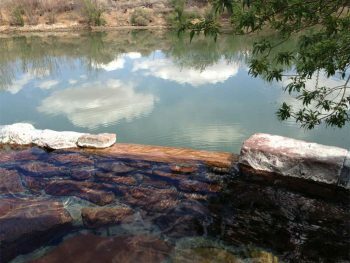 The Rio bath, one of Riverbend Hot Springs’ beautiful private pools (with a view of the Rio Grande!). 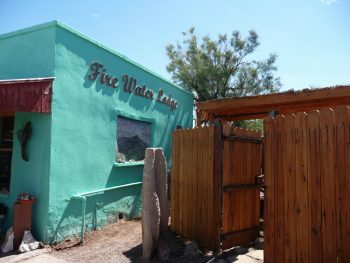 Sunny, warm and breezy: a perfect day to try out Fire Water Lodge’s outdoor bath. 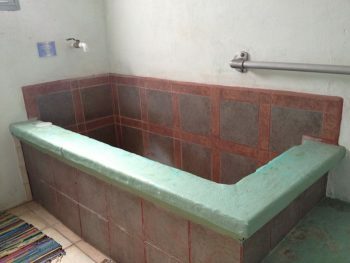 Soaking it up at the uber-authentic Artesian Mineral Baths. A mini vacation on the roof of the Charles Motel & Spa. The Long House at Hay-Yo-Kay, plus a lot of information about Truth or Consequences hot springs, not to be confused with mineral baths. Blackstone HIstoric baths – best kept secret of the budget-friendly half-hour soak in T or C? Hanging out (literally) in one of La Paloma Hot Springs’ private artesian baths. A luxurious soak in the beautiful Mineral Bath at the Sierra Grande Lodge and Spa. 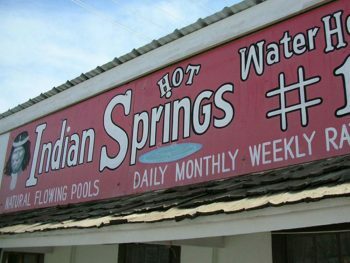 Day 4 takes me to Indian Springs small bath – a first for me! It’s a perfect soaker for a party of one. Fire Water’s baths are normally for Fire Water Lodgers only, but I’m given a free pass as part of the “21 soaks” project. 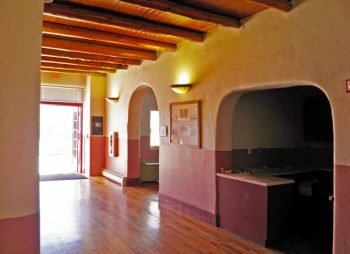 The Charles was built in the 1930s and while it has been updated, the pink-tiled baths in the ladies’ hot spring bathing area retain their historic feel. Day One of the 21 day soaking adventure begins at Blackstone Hotsprings’ Historic Bath #2. 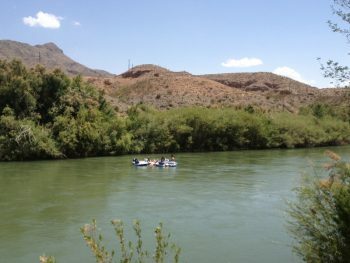 Geronimo Trail Visitor Center Employee Isabelle Court – Inexhaustible! Courteous, energetic, knowledgeable, ready to assist, and comes with a cool accent: that’s Isabel. 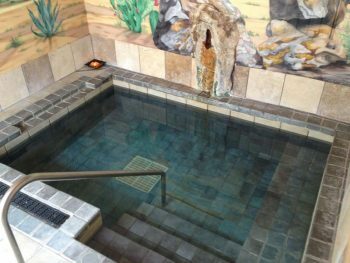 The website for one of our local hot spring spas says this: “Local legend has it that taking the waters 3 times a day for 21 days in a row will cure anything that ails you.” That’s a cool legend, right? But…is it true? BANA’s mission is to support the research, information exchange, and education of the health benefits of natural mineral waters. 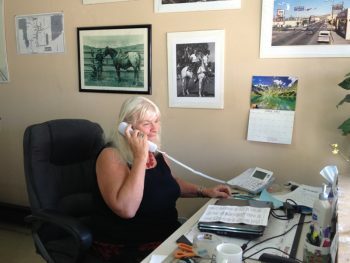 Visitor Center employee Isabel Court goes the extra mile. 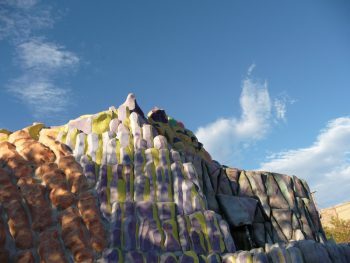 Check out these cool formations in the local landscape: Turtle Mountain, Elephant Butte, and the Sleeping Indian. It’s a great story. But it wasn’t really a hospital. 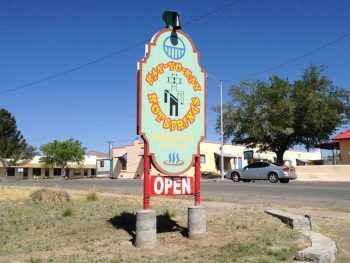 New Mexico turned 100 years old in 2012. Happy Birthday baby! 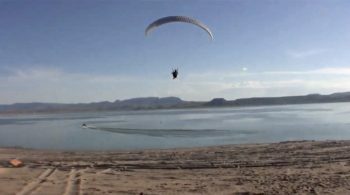 Imagine, if you can, soaring high over the lake while wearing your own pair of wings. 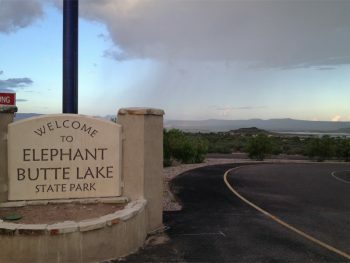 Elephant Butte Lake – Campfires Allowed! 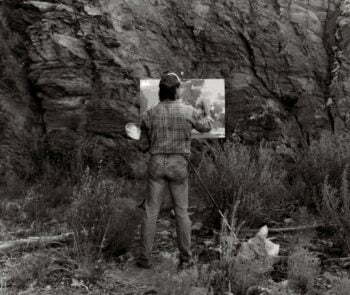 Always a good idea to check with park rangers before building a fire, of course. 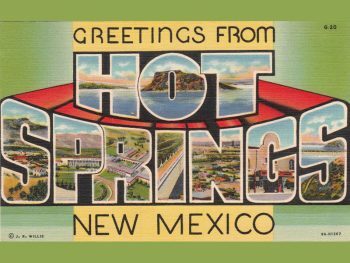 Truth or Consequences, the town named after a game show, was called Hot Springs until 1950. 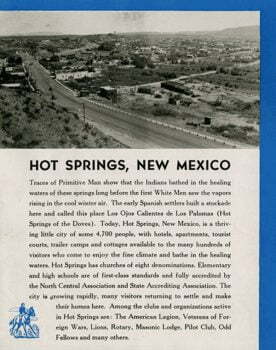 Piping hot mineral water is still available at 10 downtown spas.